Looking for the perfect gift idea? Consider the gift of travel the next time you need a birthday, wedding or graduation gift for someone special. American Airlines Gift Cards can be easily redeemed online at AA.com or by calling American Airlines reservation. You can use up to eight (8) Gift Cards at one time toward the purchase of a ticket to hundreds of exciting destinations throughout the world. And, with no expiration date or fees, American Airlines Gift Cards are perfect for any occasion. National Gift Card is the best place for you to order American Airlines gift cards in bulk. We are the experts in all things gift cards and can set up your gift card solutions program for you today. Please contact us for more information on American Airlines bulk, direct-to-recipient, or individual gift card fulfillment for your gift card program. Contact us here or call us at 888-472-8747 today! American Airlines Gift Cards are redeemable toward the initial electronic ticket purchase of air travel wholly on flights operated by American Airlines, American Eagle® and AmericanConnection® carriers for itineraries sold and originating in the U.S., Puerto Rico and U.S. Virgin Islands. AA Gift Cards are also available for payment of air travel on any oneworld® partner or AA* Codeshare flight. They cannot be used for payment of air travel on any other airline. Flights sold or originating outside the U.S., Puerto Rico or U.S. Virgin Islands or operated by other carriers are not eligible. 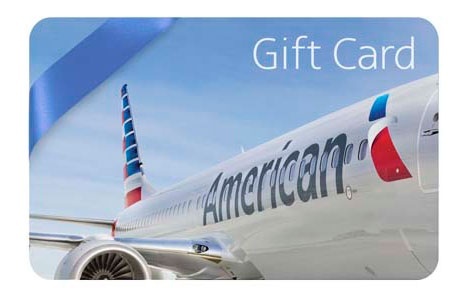 Gift Cards are redeemable online at www.aa.com or by calling American Airlines Reservations. Gift cards cannot be redeemed at airport ticket counters or travel agents. Transactions through American Airlines Reservations are subject to an additional charge which must be paid separately by credit, debit or charge card. If the ticket price is greater than the value of the Gift Card(s), the difference may be paid only with a credit, debit or charge card with a billing address in the U.S., Puerto Rico or U.S. Virgin Islands. If the ticket price is less than the value of the Gift Card(s), the unused portion will remain on the Gift Card until it is decreased to zero, at which time the Gift Card will be deactivated. Gift Cards are redeemable toward the purchase of the base air fare and directly associated taxes, fees and charges that are collected as part of the fare calculation. Gift Cards may not be used for products and/or services that are sold separately, such as upgrades; Admirals Club membership enrollments or One-Day Passes; excess baggage fees; pet fees; unaccompanied minor fees; oxygen fees; ticketing fees for transactions processed through American Airlines Reservations; taxes, fees or charges payable in connection with AAdvantage® award travel; AmericanAirlines Vacations SM or non-flight products and/or services sold by American Airlines. American Airlines Gift Cards are issued by American Airlines Marketing Services, LLC (AAMS). AAMS reserves the right, and holder or purchaser of a Gift Card agrees that, AAMS may at any time change the terms of the program or contract with a third party to administer the Gift Card program. For complete terms and conditions see aa.com/giftcard.